PVC foams came into use as core materials in the 70's. As sandwich structures in marine applications began to be optimized, a need for a low-density, consistent, moisture resistant core material was realized. Formulations were refined over the years and the characteristics of PVC foams fit the needs of the marine industry well. PVC foams are closed-cell, moisture resistant, and have good physical properties when compared to other foams of similar density. PVC foam is technically an Interpenetrating Polymer Network (IPN) of PVC and polyurea. The interaction of these polymers gives the foam its unique characteristics. Although, the foam is a thermoses, it can still be thermoformed. In addition, it is resistant to many solvents including styrene and most fuels, yet is compatible with most adhesives and laminating resins. PVC foam is closed-cell and has very low moisture absorption. It is self-extinguishing and will not rot. Other inherent properties are excellent fatigue life and good bond strength with common adhesives and resins. PVC foams are available in a variety of densities from 3pcf to 25 pcf (45kg/m3 to 400kg/m3). Unlike polyurethane foam, PVC foam is not a two-component pour in place type of foam. The manufacturing process is much more involved. The raw ingredients are mixed together under controlled conditions and dispensed into a mold. The filled mold is then sealed, placed in a large press and heated while remaining clamped shut. After this process is completed, a slab of solid material emerges from the mold. The material is then expanded in a hot water bath to final density and cured. The cured blocks are then cut into sheets of a varying thickness, depending on customer requirements. 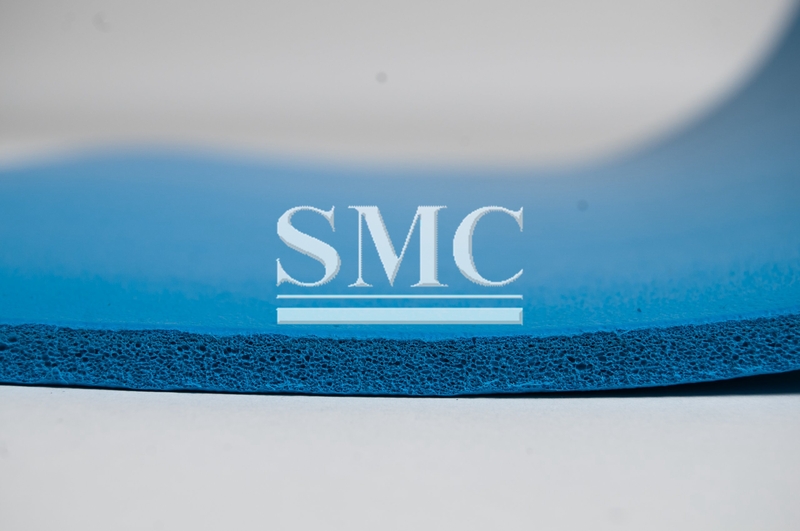 The process and formulation combine to give the foams their closed-cell nature and excellent physical properties. PVC foams can be formulated in rigid or ductile versions. Rigid PVC foams, sometimes referred to as crosslinked, have higher heat and solvent resistance than ductile foams. In addition, the physical properties are generally 20-40% higher. Shear strain to failure for rigid PVC foams varies with density between 12-30%. Ductile PVC foams, sometimes referred to as linear, have higher shear elongation to break, typically in excess of 40%. However, ductile foams have lower physical properties, heat and solvent resistance for a given density.